It's been a while since I last reviewed a book and that's very lazy of me. Here is new review. 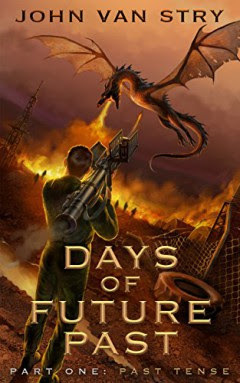 Days of Future Past - Part 1: Past Tense is an adventure fantasy where someone gets plucked from the present to fulfill his destiny to save the future. Except that's not the main character - he was just accidentally included. And it's a tough ride for him - he gets betrayed and sold into slavery within the first few chapters. But with the help of a trickster God, the same one responsible for his accidental trip to the future, he manages to get out of that problem and embark on his own adventures. First thing I want to say about this book - the cover is really awesome. I appreciate good cover art and this one made me want to read the book. Also I like stories about people getting transported to a vastly different setting, so I enjoy that. I liked the twist of Paul not being the "savior", just a guy in the wrong place, wrong time. When the story starts out Paul is a really angry guy, and I that actually made him more interesting. Rather strange because I usually don't like angry characters at all. As the story progressed he calmed down and I rather regretted it. The character had more intensity in his angry phase. A lot of the story is what I would call a guy's fun fantasy - gambling, hot chicks, derring-do in the face of danger. I'm the wrong reader for that, actually, but I can see the appeal. Overall, Days of Future Past - Part 1: Past Tense is the start of a fun guy's guy adventure into a future that mixes tech and magic. By the way, the next book in the series, Days of Future Past - Part 2: Present Tense, has just been released.